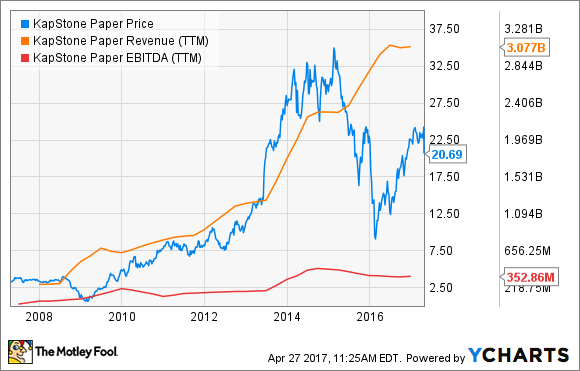 Despite revenues moving higher year over year, KapStone missed analysts' estimates on both the top and bottom lines. Shares of KapStone Paper and Packaging Corp. (NYSE:KS), a producer of unbleached kraft paper, corrugated packaging products, and other products, were down 13.4% as of 1:05 p.m. EST after investors digested the company's first-quarter results. It's not surprising investors are selling the stock today, as the Q1 results were pretty depressed across the board. Though net sales actually increased 4% to $766 million, that missed analysts' consensus estimate for $779 million. And that was essentially the only year-over-year increase that KapStone posted in its major metrics. Year over year, adjusted-EBITDA declined 9% and adjusted net income fell a staggering 32%. Adjusted earnings per share checked in at $0.15, which was a 35% decline from last year's $0.23 per share, and below consensus estimates predicting for $0.22 per share. "While first quarter results were disappointing, we are experiencing exceptional positive momentum. Demand for containerboard, corrugated boxes, and kraft paper is strong. Pricing across our important product lines is rapidly increasing. Our product mix has improved as domestic containerboard and box sales have increased while exports have declined." In fairness to KapStone, its distribution business is entering the seasonally strong portion of its year. While that won't help it relative to analysts' estimates, it will be critical to proving to investors that the company can continue improving its top-line revenue as it has over the past decade. Thursday's 13%-plus decline seems justified, even if management believes the second half of the year will be much stronger. Add in the fact the company's debt-to-EBITDA leverage ratio was nearly 4 at the end of the first-quarter -- albeit, with no principal payments due until 2019 -- and you have a risky stock that could head even lower if the business hits any speed bumps in the next few quarters.